15 Asoo 1574 Bikrmi Shri Guru Nanak Dev ji reached Manikaran with his two disciples Bala and Mardana. Here Mardana felt hungry but there was no source to cook meals. Guruji asked Mardana to lift a stone. Mardana did and a hot water spring discovered. As directed by Guruji Mardana put the rolled chapatis in the spring, to his despair the chapatis going down. As said by Guruji he prayed to God in case his chapatis float he would donate one chapati in the name of God. When he prayed all the chapatis started floating duly baked then Guru ji said listen Mardana whoever donate something in the name of God all his/her articles float. Since then Hot spring discovered by Guru ji is still flowing and food is prepared in that spring. 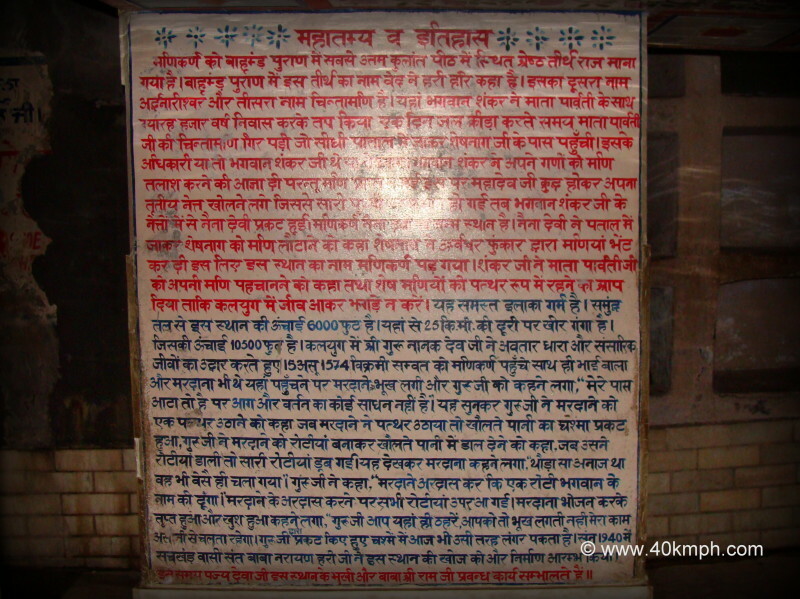 In 1940 Sant Baba Narain Hari ji discovered this place and constructed Gurudwara. It is also believed once Goddess Parvati lost her Chintamani (ear ring) which reached straight to Shesh Nag in Patalok. On being told by Parvati, Lord Shiva ordered Ganas and Bhootas to search Mani but they failed. Shiva grew angry and opened his third eye. Naina Devi produced from the eye of Shiva and Manikaran became the birth place of Naina Bhagwati. She went to Shesh Nag and asked to return Mani. Shesh Nag obliged by making a loud snif. Due to snif hot water springs busted out and many other jewels came out. Goddess Parvati took away her Mani and Lord Shivaâ€™s became calm and from then this place is known as ‘Manikaran’.